This is an interesting article on human physiology. It discusses research that has been done at University of Utah on human hand physiology and anatomy. The researchers asked a question if a strike with a palm is as strong as a strike with a fist. Well, as Bas Rutten would tell you, it is!!! An interesting scientific confirmation to what many self-defense experts claimed for a long time… Striking with an open psalm is as effective as a punch. Further more, based on their research, unlike other hominid apes, humans are the only ones who can form a fist as we understand and use it for striking. So according to this research we are physiologically structured to punch and hit things and others. I found it also interesting, that the researchers are willing to assume a controversial approach, at least for a scientific community, that humans are intrinsically aggressive animals, especially males. Aggression and violence is part of our anatomy and psychology. And I believe that it is possible and beneficial to engage that part of our human self and it can be done with martial arts and other competitive contact sports. Fighting may have shaped the evolution of the human hand, according to a new study by a US team. The University of Utah researchers used instruments to measure the forces and acceleration when martial artists hit a punch bag. They found that the structure of the fist provides support that increases the ability of the knuckles to transmit “punching” force. Details have been published in the Journal of Experimental Biology. “We asked the question: ‘can you strike harder with a fist than with an open palm?’,” co-author David Carrier told BBC News. Of course, the surface that strikes the target with a fist is smaller, so there is more stress from a fist strike. “The force per area is higher in a fist strike and that is what causes localised tissue damage,” said Prof Carrier. 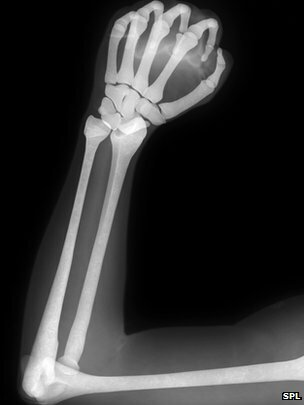 The team found that making a clenched fist did indeed provide protective buttressing for the delicate bones of the hand. Making a fist increased the stiffness of the second meta-carpo-phalangeal, or MCP, joint (these joints are the knuckles visible when the hand is clenched as a fist) by a factor of four. It also doubled the ability of the proximal phalanges (the bones of the fingers that articulate with the MCP joints) to transmit a punching force. In their paper, Prof Carrier and Michael H Morgan from the University of Utah’s school of medicine, point out that the human hand has also been shaped by the need for manual dexterity. But they say that a number of different hand proportions are compatible with an enhanced ability to manipulate objects. “There may, however, be only one set of skeletal proportions that allows the hand to function both as a mechanism for precise manipulation and as a club for striking,” the researchers write. Our closest relatives, chimpanzees and bonobos do not generally form fists, and the researchers think they are unable to: when a chimp curls up its fingers it forms a doughnut shape. Asked whether the idea that aggression may have played a key role in shaping the human body might previously have been unpalatable to researchers, Prof Carrier explained: “I think we’re more in that situation now than we were in the past. “I think there is a lot of resistance, maybe more so among academics than people in general – resistance to the idea that, at some level humans are by nature aggressive animals. I actually think that attitude, and the people who have tried to make the case that we don’t have a nature – those people have not served us well.